The Redwood City Improvement Association, a non-profit community benefit district that works to enhance Downtown Redwood City, in partnership with Redwood City Parks, Recreation and Community Services Department; Redwood City Parks and Arts Foundation; and the Partnership Redwood City Program will install 20 eclectic sidewalk shadow art stencils—a flat shadow dimensional art effect using stencils—to be completed by Damon Belanger, a local graphic artist from San Carlos. 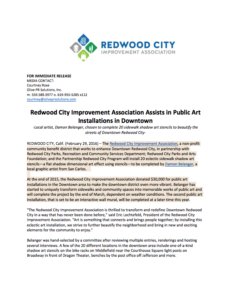 At the end of 2015, the Redwood City Improvement Association donated $30,000 for public art installations in the Downtown area to make the downtown district even more vibrant. Belanger has started to uniquely transform sidewalks and community spaces into memorable works of public art and will complete the project by the end of March, dependent on weather conditions. The second public art installation, that is set to be an interactive wall mural, will be completed at a later time this year.